Carl Gustav Carus (1789–1869), View of Dresden from Brühl's Terrace (1830-31), oil on canvas, 28.5 x 21.7 cm, Museum Georg Schäfer, Schweinfurt, Germany. Wikimedia Commons. Up to the middle of the 1820s, the paintings of Carl Gustav Carus (1789–1869) had shown close links with those of his teacher, Caspar David Friedrich. But increasingly Carus was developing his own style and motifs. Carl Gustav Carus (1789–1869), The ‘Three Stones’ in the Giant Mountains (1826), oil on canvas, 64 x 92.5 cm, Staatliche Kunstsammlungen Dresden, Dresden, Germany. Wikimedia Commons. In about 1820, Carus had painted a neolithic site on the Baltic island of Rügen. 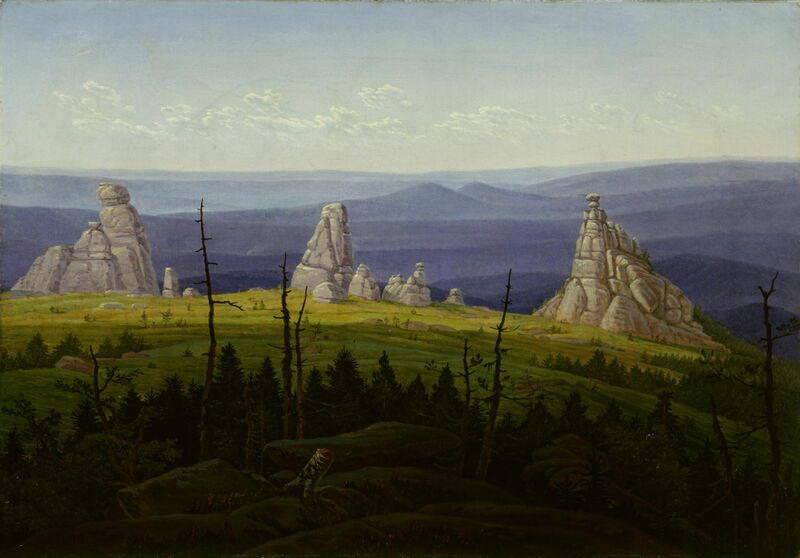 In 1826, he painted this view of The ‘Three Stones’ in the Giant Mountains, showing a natural granite formation in what is now Poland, in the Riesengebirge Mountains, and perhaps better known as Pielgrzymy. Carl Gustav Carus (1789–1869), Barge Trip on the Elbe near Dresden (Morning on the Elbe) (1827), oil on canvas, 29 x 22 cm, Museum Kunstpalast, Düsseldorf, Germany. Wikimedia Commons. 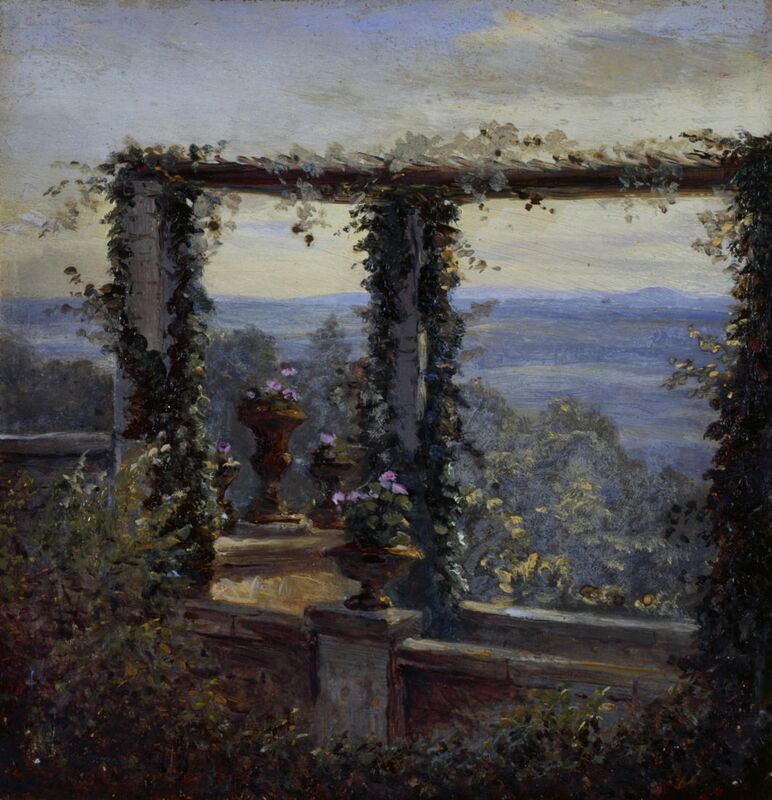 Carus also developed a fondness for distant views framed by foreground objects, which was to remain for the rest of his career. 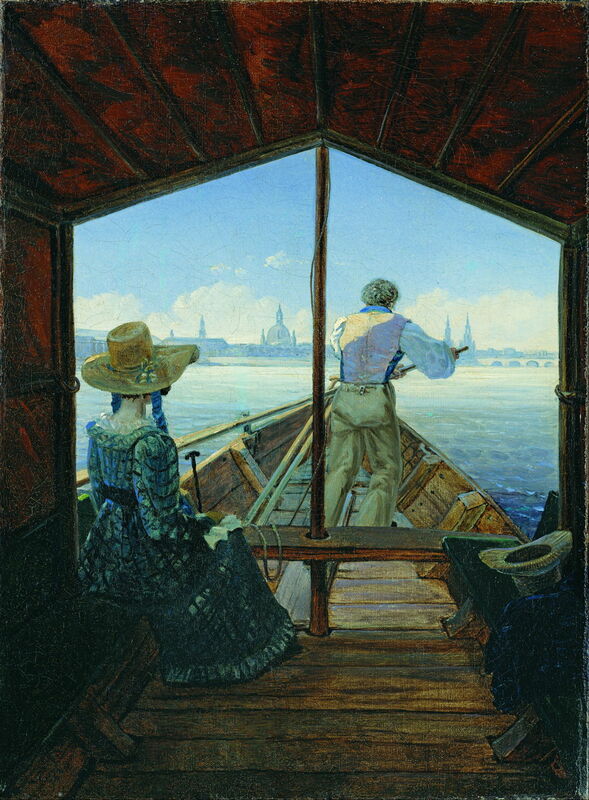 Barge Trip on the Elbe near Dresden (Morning on the Elbe) from 1827 is an early example, in which a faceless young woman and a faceless boatman are also prominent. Carl Gustav Carus (1789–1869), Castel dell’Ovo in Naples (1828), oil over pencil on wove paper mounted on cardboard, 23.8 × 27.6 cm, Private collection. Wikimedia Commons. 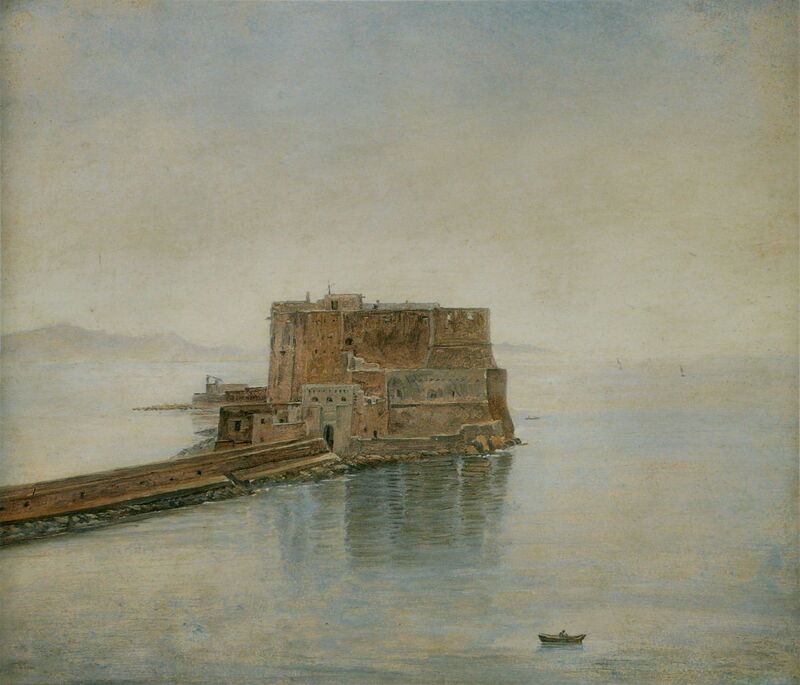 His scientific and medical career provided many opportunities to travel, and in 1828 he appears to have visited Naples in Italy, where he painted this wonderful view of Castel dell’Ovo in Naples (1828). Given that it was made in oils over a pencil drawing on paper, this appears to have been painted in front of the motif. There has been a castle on this small peninsula in the Bay of Naples since the first century BCE. The Roman original was replaced by the Normans in the twelfth century, but most of the current structure dates from the fifteenth century, and a more modern fishing port developed along this peninsula during the nineteenth century. Carl Gustav Carus (1789–1869), Clouds of Fog in the Saxon Highlands (c 1828), oil on canvas, 40 × 37 cm, Staatsgalerie Stuttgart, Stuttgart, Germany. Wikimedia Commons. 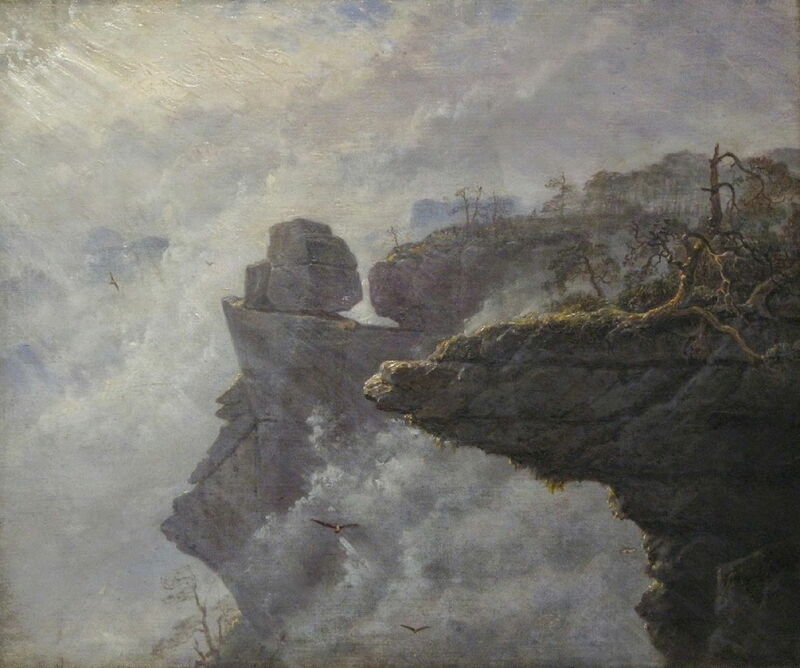 He also developed further ‘Gothic’ views of awe involving looming crags and swirling cloud in paintings such as Clouds of Fog in the Saxon Highlands, from about 1828. 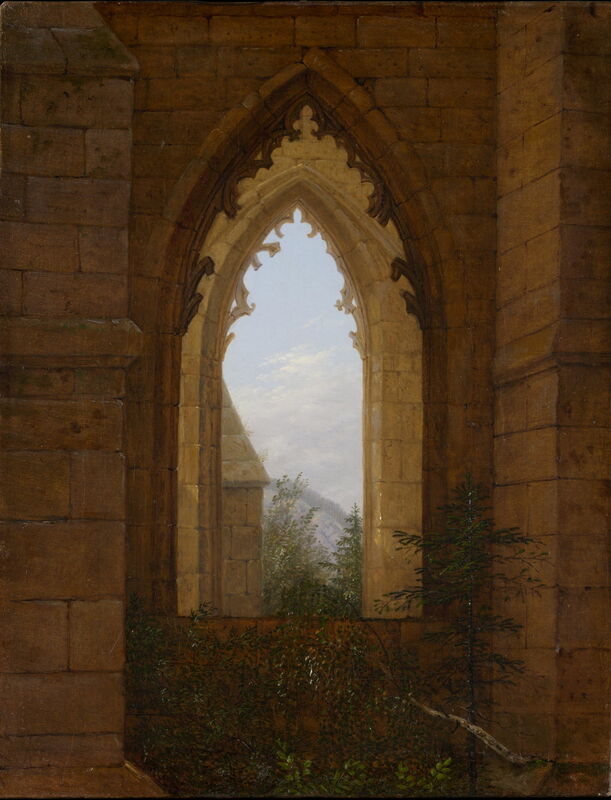 Carl Gustav Carus (1789–1869), Gothic Windows in the Ruins of the Monastery at Oybin (c 1828), oil on canvas, 43.2 x 33.7 cm, Metropolitan Museum of Art, New York, NY. Wikimedia Commons. Friedrich had earlier painted the ruins of a former monastery at Oybin in Saxony, in the far east of what is now Germany, on the border with the Czech Republic. Carus celebrated its remaining architectural details and continued his theme of windows in Gothic Windows in the Ruins of the Monastery at Oybin in about 1828. 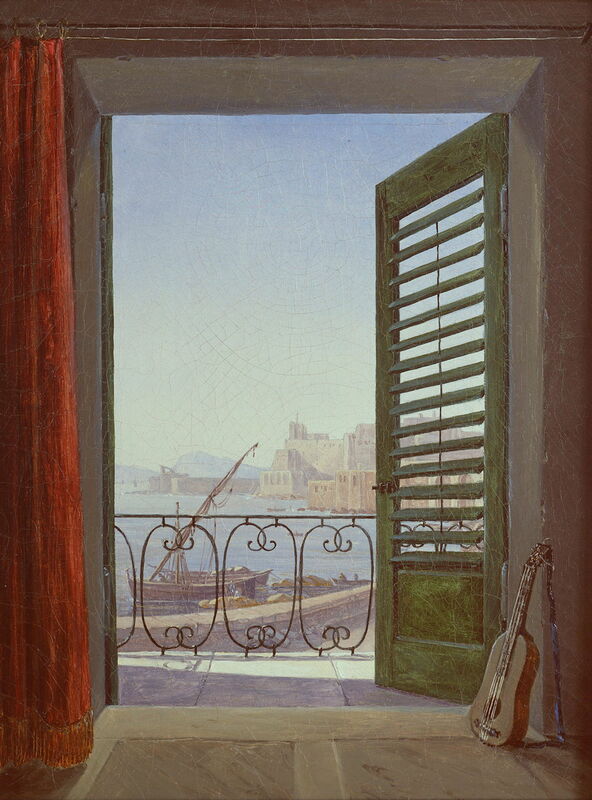 Carl Gustav Carus (1789–1869), Balcony Room with a View of the Bay of Naples (via Santa Lucia and the Castel dell’Ovo) (c 1829-30), oil on canvas, 28.4 x 21.3 cm, Alte Nationalgalerie, Berlin, Germany. Wikimedia Commons. Carus appears to have visited Naples on other occasions too. In about 1829-30, he stayed close to Castel dell’Ovo, which he had painted in 1828, and framed a view from sea level in his Balcony Room with a View of the Bay of Naples (via Santa Lucia and the Castel dell’Ovo). The district of Santa Lucia consists of the waterfront buildings seen here between Carus’ accommodation and the Castel dell’Ovo. 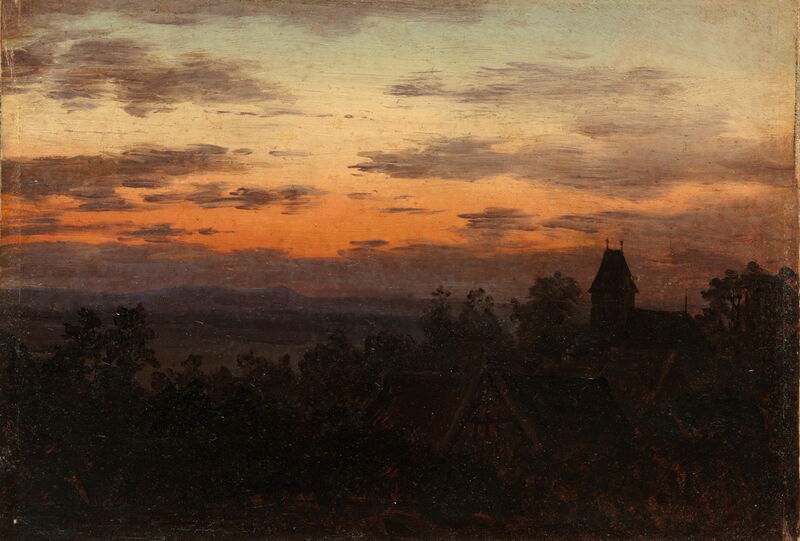 Carl Gustav Carus (1789–1869), Landscape at Sunset (c 1830), oil on paper mounted on canvas, 13.7 x 19.4 cm, Metropolitan Museum of Art, New York, NY. Wikimedia Commons. Landscape at Sunset is a quick plein air oil sketch which could have been painted almost anywhere, but most probably shows countryside not far from Dresden in Saxony. It dates from 1830. Carl Gustav Carus (1789–1869), View of Dresden from Brühl’s Terrace (1830-31), oil on canvas, 28.5 x 21.7 cm, Museum Georg Schäfer, Schweinfurt, Germany. Wikimedia Commons. 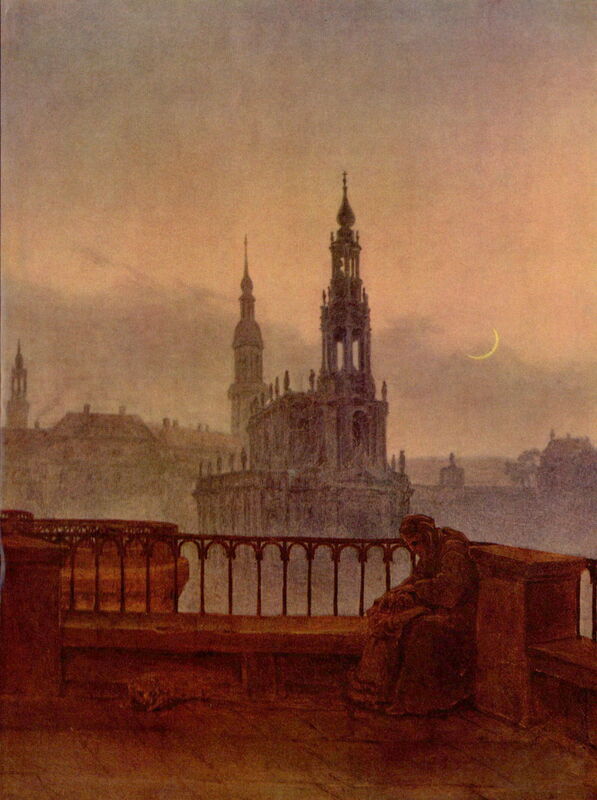 View of Dresden from Brühl’s Terrace is another late twilight view, from 1830-31. This shows an elevated embankment above the River Elbe in Dresden, a popular terrace for walking. It is named after the Count who had a city palace and gardens built here in the eighteenth century. The nearby church is the Cathedral of the Holy Trinity, which only gained the status of cathedral in 1964. Sat in a corner is a woman, and under the stone is what appears to be a skulking cat. Carus completed his first book on psychology in 1831, and over the following thirty years published groundbreaking works in the field, in which he made some pioneering explorations of the psyche and the unconscious. In the late 1840s, he also published a systematic treatise on physiology. Carl Gustav Carus (1789–1869), The Goethe Monument (1832), oil on canvas, 71 x 52.2 cm, Hamburger Kunsthalle, Hamburg, Germany. Wikimedia Commons. On 22 March 1832, Carus’ friend Goethe died in Weimar. 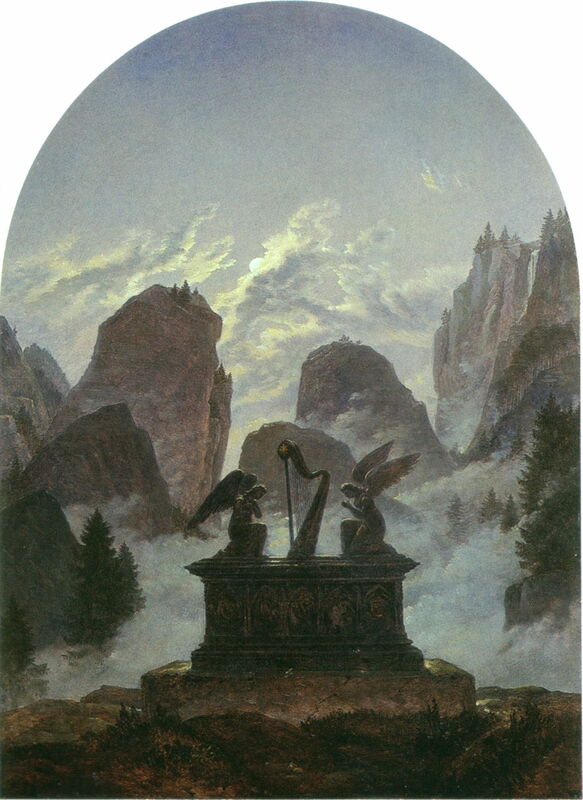 That same year, Carus painted his tribute to him in The Goethe Monument. I have been unable to locate any physical monument corresponding to this Romantic image. 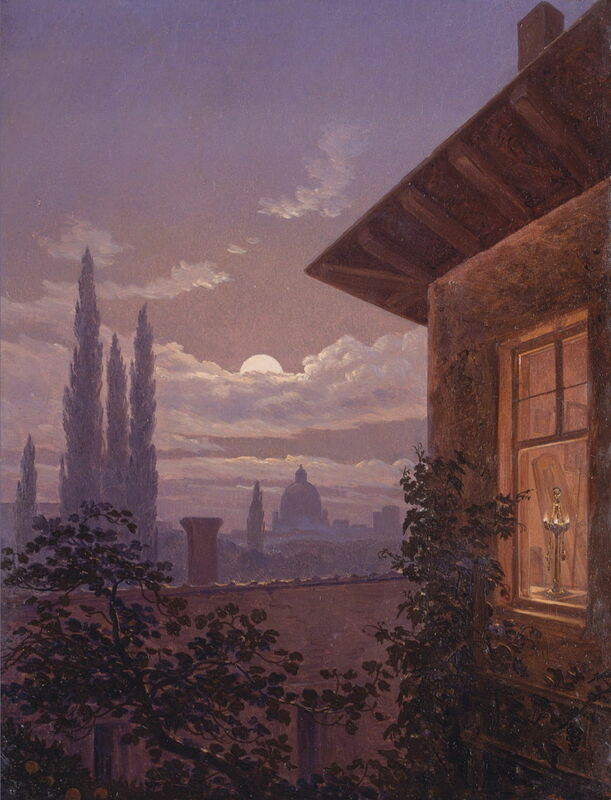 Carl Gustav Carus (1789–1869), Italian Moonlight (Rome, Saint Peter’s in Moonlight) (1833), oil on canvas, 28.3 x 21.5 cm, Freies Deutsches Hochstift, Frankfurt, Germany. Wikimedia Commons. Carus seems to have been back in Italy in 1833, when he painted this moonlit view of the dome of Saint Peter’s, in Italian Moonlight (Rome, Saint Peter’s in Moonlight). Carl Gustav Carus (1789–1869), Memory of a Wooded Island in the Baltic Sea (Oak trees by the Sea) (1834-35), oil on canvas, 117.5 x 162.5 cm, Galerie Neue Meister, Staatliche Kunstsammlungen Dresden, Dresden, Germany. Wikimedia Commons. 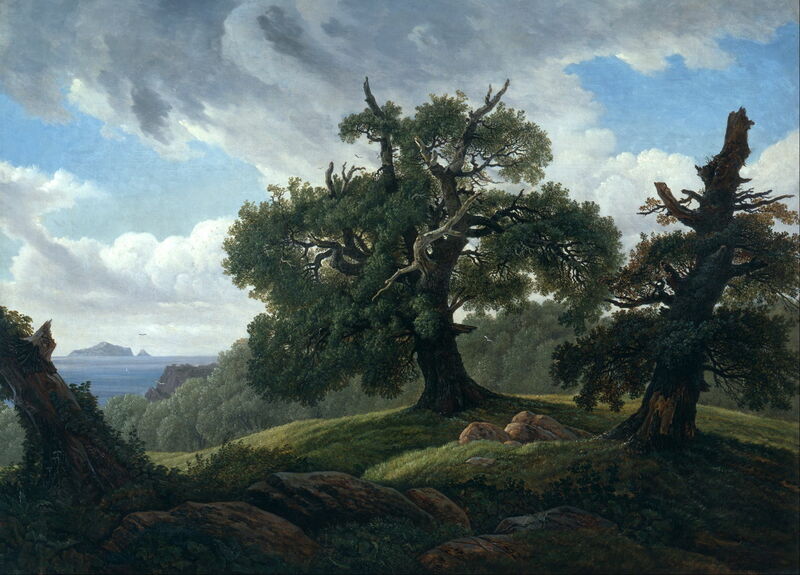 Although Carus’ nocturnes show quite a progressive style, his daytime landscapes remained traditionally realist, as shown in this Memory of a Wooded Island in the Baltic Sea (Oak trees by the Sea) from 1834-35. 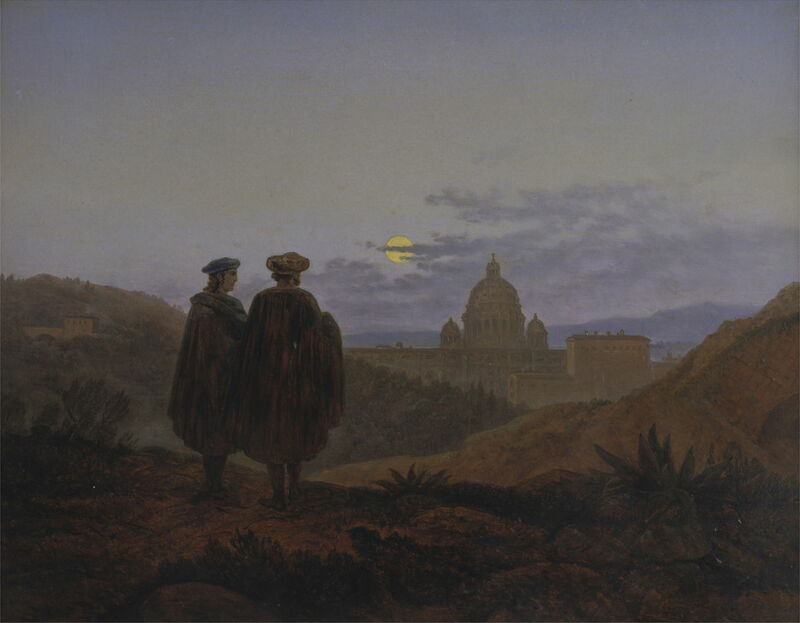 Carl Gustav Carus (1789–1869), Memories of Rome (Raphael and Michelangelo Looking at St. Peter’s) (1839), oil on panel, 36.8 x 47 cm, Frankfurter Goethe Haus, Frankfurt, Germany. Wikimedia Commons. His panel showing Memories of Rome (Raphael and Michelangelo Looking at St. Peter’s) from 1839 is a beautiful invention. Raphael idolised Michelangelo, and the two masters were in Rome together between 1508 and 1512, while the latter was painting the ceiling of the Sistine Chapel. They are alleged to have met in the street, but Michelangelo positively disliked Raphael, and Raphael tried very hard to have Michelangelo taken off the Sistine Chapel project – which was hardly likely to have brought about a meeting such as this. After about 1840, most of Carus’ surviving paintings are small oil sketches on cardboard or paper, probably made for his personal pleasure rather than to be developed into larger studio works for exhibition. Carl Gustav Carus (1789–1869), Gothic Church over Treetops in Moonlight (c 1840), oil on cardboard, 7 x 11.1 cm, location not known. Wikimedia Commons. 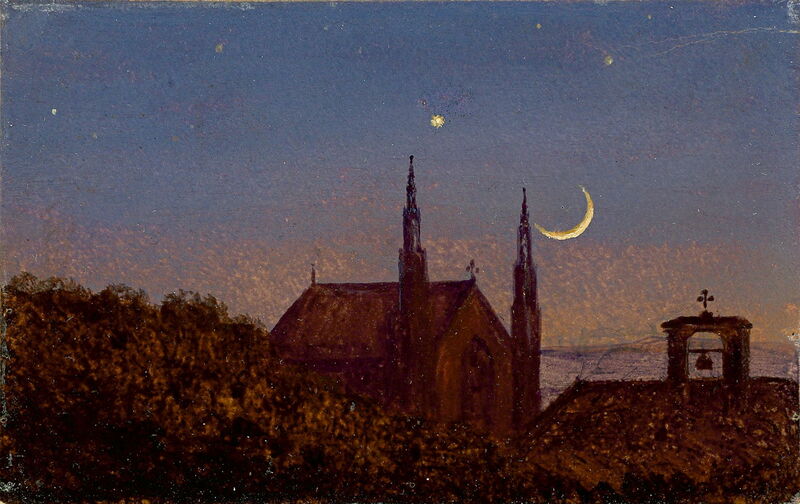 His Gothic Church over Treetops in Moonlight from about 1840 brings together all his most enduring themes and symbols: the Gothic, religion, night, and a thin sliver of a moon. Carl Gustav Carus (1789–1869), View of Florence (1841), oil on paper mounted on canvas, 13.5 x 19.5 cm, Staatliche Kunstsammlungen Dresden, Dresden, Germany. Wikimedia Commons. 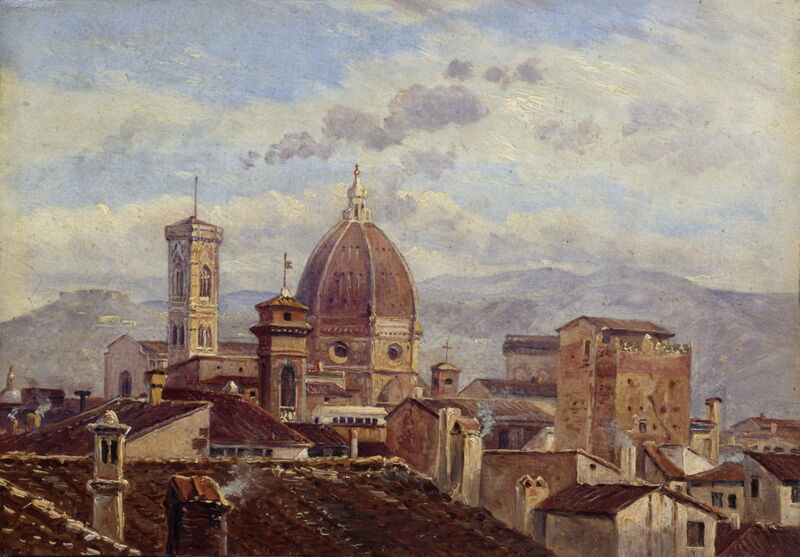 He appears to have painted this View of Florence (1841) from the window of his accommodation when visiting the city. The dome is that of the Duomo (Cattedrale di Santa Maria del Fiore), Brunelleschi’s masterpiece, which is slightly exaggerated in its height here. In 1844, Carus accompanied the King of Saxony on an informal tour of Britain. He stayed at Windsor Castle as the guest of Queen Victoria, visited the universities of London, Oxford and Cambridge, and travelled through Wales and Scotland too. During this visit, he appears to have painted the ruins of Tintern Abbey, on the Welsh border, a classical ‘Gothic’ site which was popular with contemporary artists including JMW Turner. Carl Gustav Carus (1789–1869), View of Hosterwitz (c 1850), oil on paper mounted on canvas and panel, 12.6 × 12 cm, Staatliche Kunstsammlungen Dresden, Dresden, Germany. Wikimedia Commons. This delightful View of Hosterwitz from about 1850 appears to show the rolling countryside around Dresden; Hosterwitz is at the south-eastern edge of the city, roughly midway between Dresden and Pirna, on the north-east bank of the River Elbe. Carus died in Dresden on 28 July 1869, at the age of eighty, but his innovative ideas lived on in Darwin’s theory of evolution, and in Carl Jung’s psychology of the unconscious. Posted in General, Life, Painting and tagged Carus, Friedrich, Goethe, landscape, painting. Bookmark the permalink. I really enjoy discovering new paintings here on your blog. Sometimes they have an unexpected connection to real life. Today I laughed at “Barge Trip on the Elbe” because this morning my husband took me out on a motor boat, just the two of us. I was a reluctant passenger but like the man holding the oar in Carus’s painting my Captain was in control and the journey was very enjoyable. I showed him the painting and he laughed. Thank you. I couldn’t have guessed how appropriate that might have proved! I hope that you enjoyed the trip nevertheless. thanks for turning me on to this painter. the work is so beautiful. I’ve known of this painter for ages, but not really looked properly at his work (as much as one can online), or thought much about him, until I came across this lovely post. Thank you. I had come across him in the context of Friedrich and in his scientific career, but this is the first time that I have looked at his paintings. Last Week on My Mac: Where will all those coders go?